Everyone has been to meetings that go on and on or where everybody is sitting and fiddling with their smartphone or tablet. And we’ve all been in the meeting where a certain someone from accounting goes off on a tangent talking about nothing in particular just for the sake of talking. These are the types of meetings we all dread attending as there are far too many yawns and much too little work getting done. Many business owners look at team meetings as a huge waste of time. However, every successful business must hold regular meetings with all the key players in attendance in order to keep things on the right track. Even a brand new business needs to have regular meetings to make sure the team is working cohesively and getting things done according to schedule. If you’re a new business owner who wants to make sure your team meetings are not a waste of time, here are five ways that will guarantee your meetings run quickly and efficiently. It makes no sense to gather the team together for a meeting if you don’t know what it is you’re supposed to be talking about. This is why you need to have a main purpose for your meetings. Be really clear when defining the purpose. Do you need to focus on your chain-of-command? Then write down the main points you need to cover before the meeting. It’s also a good idea to send out memos ahead of time so everyone knows the main talking points of the scheduled meeting. This is a good way to prepare everyone as your team will be ready to join the conversation and add value to what’s being discussed. It’s so common for the typical new business to spend far too much time gathered around the conference table wherein nothing much of anything gets accomplished. Instead of just calling a meeting and allowing the time to slowly tick away, set a time limit for every meeting you hold. Let everyone know how much time you have allotted for the meeting so people know they won’t be sitting there forever. Plus, when you set a time limit people will be more focused on getting the conversations going and work completed. 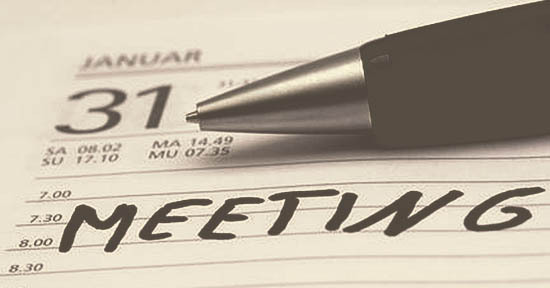 The only way your meetings will be productive is if the right people are in attendance. Sure, you could invite everyone to be on the safe side, but that’s not a very wise thing to do. It makes no sense to invite staff who have nothing to do with the topic being discussed nor is it sensible to invite people who won’t have anything valuable to contribute because the things being talked about just don’t pertain to them. Once you define the purpose of your meeting, you will know exactly who should be in attendance and who is only going to be wasting time by being there. When everyone at a meeting has their smartphone, tablet computer or laptop turned on and in front of them, there are going to be distractions and many of them. This is why you should require everyone to turn off and unplug their devices prior to the start of your meetings. Even better, completely ban these items from the meeting room as they’re nothing but disruptive when you’re trying to plan projects and discuss topics. Plus, when everyone is gadget-free, they will be more focused on the meeting wherein things will move along quickly and efficiently. If your team insists they need their devices on for note taking, don’t give in. Instead, appoint someone at the meeting to take notes and then make copies and distribute the notes to all in attendance later on. Alternatively, you could record your meetings and then give your staff access to the electronic audio files.